MIDDLE-RANKING GARDAÍ today called for a law that would require cyclists to wear high visibility vests and helmets. 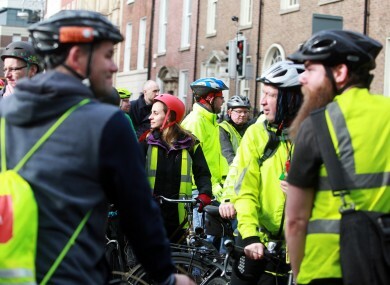 “The amount of fatalities and serious injuries – even minor injuries in cyclists, especially in the DMR [Dublin Metropolitan Region] is huge so we’d just like shift the mentality and attitudes of cyclists to encompass their own safety and take that on board,” Sergeant Clare Healy said. I mean we’ve all walked around the city centre, cycled around the city centre, drove around, you see people stepping out, trucks taking corners short. So you need to protect yourself. And fluorescent jackets and helmets are absolutely the way to go in my personal opinion. Delegates at the conference have suggested a penalty in the form of a fixed charge notice. “Originally people thought it’d be difficult to police this on motorbikes decades ago and we’ve moved on – it’s about changing people’s attitudes and behaviours and education and people develop and move on and it’s the norm,” Healy said. The motion, before it was amended at the conference, included a requirement for pedestrians wear vests. Though this was removed from the motion, some of the middle-ranking gardaí at the conference said it is still something they would like to see considered in rural areas late at night. One sergeant noted recent research that found wearing reflective clothing improves visibility by over 500 metres. “In rural areas people are walking home at three or four in the morning on winding roads and they can’t be seen”, Healy said. Sergeant Gerry Moylan, who is stationed in Sligo, pointed out that in 2016, 35 pedestrians were killed on Irish roads and 23 of these were in rural areas. Email “Gardaí want law to force cyclists to wear high-vis vests and helmets”. Feedback on “Gardaí want law to force cyclists to wear high-vis vests and helmets”.